MANY PEOPLE SUFFER FROM RECEDING HAIRLINES, BALD PATCHES AND/OR LOSS OF HAIR AT ALL AGES. THESE PROBLEMS CAN OFTEN LEAD TO SELF-CONSCIOUSNESS, LOW SELF ESTEEM AND WORRIES ABOUT TRYING TO COVER UP PROBLEM AREAS. NOW THIS CAN EASILY BE SOLVED WITH OUR HAIRLINE TATTOO. 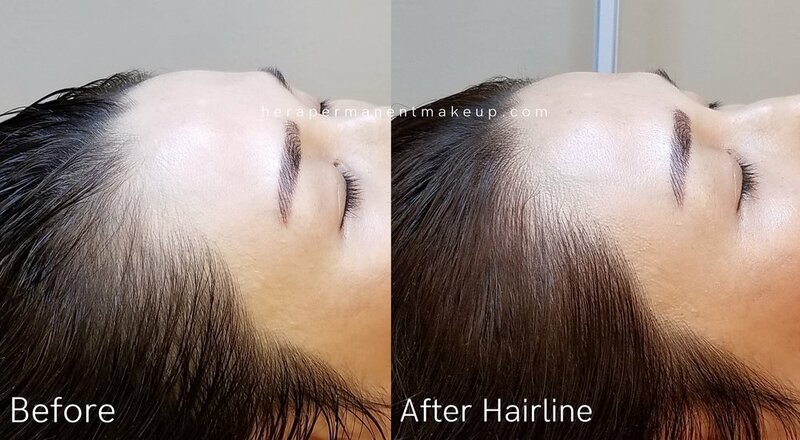 HERE AT HERA PMU WE UTILIZE THE ART OF MICROBLADING TO CREATE HYPER-REALISTIC HAIR SIMULATING STROKES ALONG THE HAIRLINE SO YOU CAN BECOME MORE CONFIDENT IN YOURSELF! THIS IS NOT ONLY LIFE CHANGING FOR INDIVIDUALS WHO WISH TO FILL IN PROBLEM AREAS BUT ALSO FOR THOSE WHO WISH TO REDUCE THEIR FACE SIZE/SHAPE.